Extreame Savings Item! 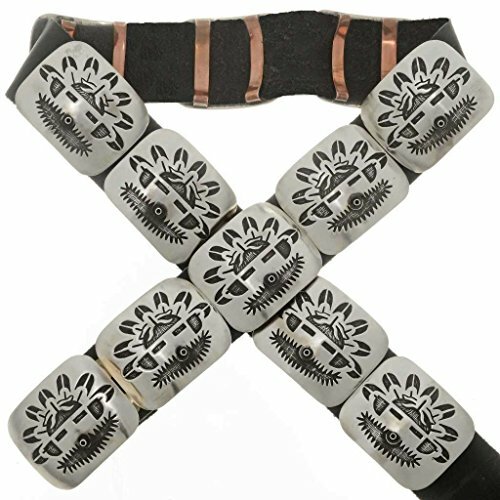 Save 48% on the Kachina Overlaid Silver Concho Belt Navajo Hallmarked by Alltribes at Nicky's Blog. Hurry! Limited time offer. Offer valid only while supplies last. Kachina Overlaid Silver Concho Belt This Kachina Overlaid Silver Concho Belt offers a unique style that's rarely seen in these southwest accessories. Kachina Overlaid Silver Concho Belt This Kachina Overlaid Silver Concho Belt offers a unique style that's rarely seen in these southwest accessories. Each Sterling station depicts the Hopi Early Morning Singer spirit ready to lead tribal members in song. The dimensional design includes the matching buckle & there are eleven, 2-1/4" x 1-3/4" stations threaded on 1-1/2" wide, genuine leather. Taken in trade, the buckle is hallmarked G & Sterling. This exceptional, Kachina Overlaid Silver Concho Belt is one of a kind & a real southwest looker! Please add your size & preferred leather color in the required fields. Belt Sizing: take your pants waist size and add 4" to it. For example: 38 pants = 42" belt size. If you follow these step, yours will fit perfectly. If you have any questions about this product by Alltribes, contact us by completing and submitting the form below. If you are looking for a specif part number, please include it with your message.